Published on ABC.es on 13 September 2013. Santa Compaña. The Santa Compaña (Holy Company) is a procession of dead or lost souls wandering at night after midnight village roads and paths. The rationale of the procession’s route is to visit the homes of all who are going to die soon. The myth is present with different variations throughout the Asturian and Galician cultural heritage, however, in each region is usually known by a different name. Tower of Hercules. There are several legends about the construction of the only Roman lighthouse still in operation today. The most famous ensures that a giant known as Geryon, king of Brigantium (Breogán), terrified his subjects who therefore were forced to give half of their possessions, children included. One day the subjects, faced with the futility of revolt against the giant, decided to seek help from Hercules, who challenged him in a bloody battle. Hercules defeated Geryon, buried him, and raised a mound crowned with a torch over the burial site. Near the monument he founded a city and, as the first person to arrive was a woman named Cruña, Hercules gave the city its name, La Coruña. Legend of the Apostle. 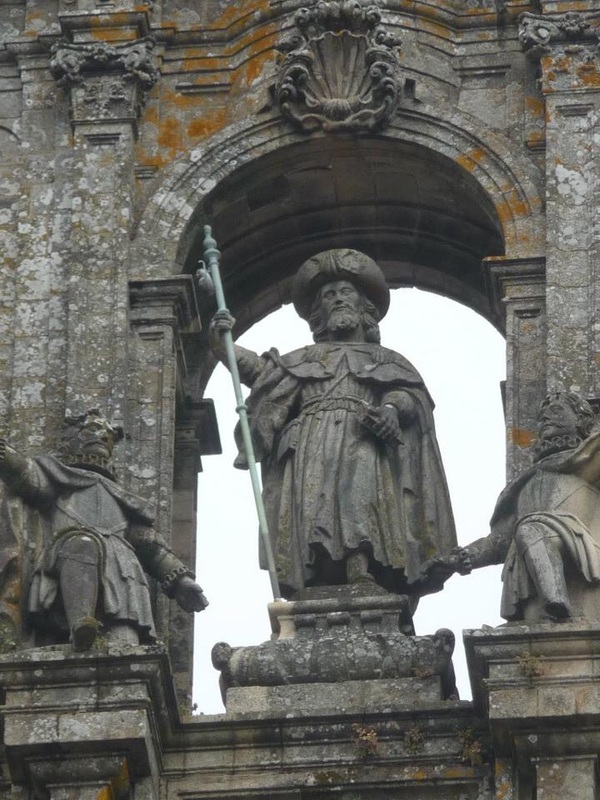 Legend has it that the remains of the Apostle Saint James, accompanied by four of his faithful disciples, plied the Ria de Arousa and Ulla in a stone boat to get to Galicia. Once ashore, they tied the boat on a stone, known as the Pedrón in Iria Flavia. After many difficulties that his disciples had to overcome, they were able to bury the Apostle near the forest Liberum Donum. The existence of the tomb was forgotten after centuries of prohibitions that prevented visits until around the year 813 a hermit saw the site shining and went to investiage. As a result the site was called Campus Stellae, or Field of the Star, from which Compostela is derived. The crown of fire. It is said that there was an underground passageway between the Palace of Monforte de Lemos and the Church of San Vicente del Pino. During an absence of the Count of Lemos, who left to fulfill royal duties, the abbot of the Benedictine Monastery of San Vicente would use the passageway to reach the count’s daughter, with whom he began a romance. The Count, upon learning of the affair, organized a meal in which he invited the abbot, and when dessert arrived the abbot was crowned with a hot iron crown, causing his death. Paralaia Hill. Paralaia is a hill in Moaña where supposedly there is a cave full of treasure with underground passages that lead to the sea. Legend has it that the night of Saint John is the perfect night for those that want to get some of the treasure since during this night the mouras and bewitched women that live there leave the cave to wash and brush their long hair. The blacksmith from Castrelos. A blacksmith from Castrelos, clinging to his job, had let his youth go by without so much as looking at a woman, but as fate is capricious, at an advanced age he set his sights on a woman. Despite giving a young girl a great jewel, there was nothing he could do to avoid her rejection so he decided to kidnap her. The girl, very religious, asked the blacksmith that she could attend Mass every day and, seeing that the church was facing his blacksmith’s workshop, he agreed. But one day, a witch appeared to the blacksmith and told him that he would soon die and the young woman would find a young man she would marry. The blacksmith, blinded with rage took, a hot iron to disfigure the face of the girl, who was in the Church of Castrelos praying. But God intervened and protected her by walling up the south gate of the church with a stone wall that today is still preserved. The diaño. Also known as the diantre, it is a satirical elf from Galician mythology that is devoted to creating all kinds of mischief in order to ruin the journey of anyone the elf finds along the way. Behind numerous disguises but always resembling help, this elf gets up to its old tricks to get payback later in its own way. The Procession of Xás. Similar to the Santa Compaña, the only difference is that in this case they are not wandering souls of the dead but of the living. The procession marches in two rows holding a coffin. According to legend, those who are closer to the coffin will die soon, while those who are further away will live for a longer period. The miracle of Bouzas. While the journey of the remains of St. James was ending and his disciples landed in Galicia, a wedding was celebrated in Bouzas of a young couple. One of the games of the celebration consisted of some horsemen that threw their spears into the air and tried to get them before they fall to the ground while galloping on their horses. The misfortune of the newlywed resulted in his horse disobeying him, entering into the sea after the boat of the Apostle. But the groom and his horse got out of the water to the covered in scallop shells, therefore, since then, every pilgrim on the road to Santiago has on scallop shell on his or her hat. Isle of Ons. According to legend a sailor from Arousa that was on military service in Africa heard about two Moors talking about treasure. After approaching the Moor, he told him that on the Isle of Ons there was a fountain with shells of gold. Back at home, the sailor approached the island while fishing and, surprised, found the source, returning home with his pockets filled with golden shells.